Our Services are not intended for children under the age of 13 and we do not actively solicit information from children under the age of 13. IF YOU ARE UNDER THE AGE OF 13 THEN YOU MAY NOT USE THE SERVICES. You agree to use the Services in a manner that is consistent with all applicable laws, rules and regulations. The following activities are expressly prohibited and you hereby agree not to: (a) hack, (b) spam, (c) send internet viruses, worms or Trojan Horses, (d) stalk, harass or bully, (e) express or imply that any statements that you make are endorsed by Top Left Booking without our specific prior written consent, (f) interfere with or disrupt any part of the Services or the servers or networks connected to the Services, or (g) modify, adapt, sublicense, translate, sell, reverse engineer, decipher, decompile or otherwise disassemble any portion of the Services or any software used on or for the Services. Top Left Booking reserves the right to pursue any and all legal remedies available to it in the event you engage in any of these prohibited actions. Top Left Booking reserves the right to restrict, suspend or immediately terminate your access to all or any part of the Services at any time, for any or no reason, with or without prior notice. When you use the Services, Top Left Booking is granting you a limited, non-exclusive, non-assignable and non-transferrable license to access and make personal use of the Services. This license is personal and does not include any resale or commercial use of the Services. Top Left Booking owns all of the right, title and ownership in and to the Services and any copies or portions thereof. You agree not to download or modify the Services, or any portion of the Services, without the express prior written consent of Top Left Booking. Any unauthorized use by you shall immediately terminate the license granted to you by Top Left Booking. 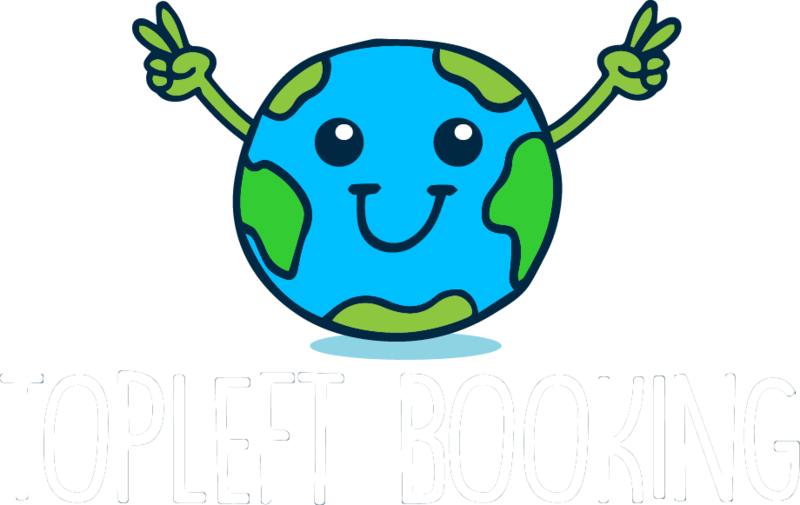 The names, titles, trademarks, service marks, and logos that appear on topleftbooking.com are registered and unregistered marks of Top Left Booking or other third parties. Nothing contained on topleftbooking.com should be construed as granting, expressly or implicitly, by estoppel or otherwise, any right or license to use these trademarks without the prior written consent of the applicable trademark owner. TOPLEFTBOOKING.COM AND ALL OF THE SERVICES ARE PROVIDED ON AN “AS IS” BASIS, WITHOUT WARRANTIES OF ANY KIND, EXPRESS OR IMPLICIT, INCLUDING BUT NOT LIMITED TO IMPLIED WARRANTIES OF MERCHANTABILITY, FITNESS FOR A PARTICULAR PURPOSE, COPYRIGHT OWNERSHIP AND/OR NON-INFRINGEMENT OF COPYRIGHTS OR OTHER THIRD PARTY PROPRIETARY RIGHTS. TOP LEFT BOOKING DOES NOT MAKE ANY WARRANTY OR REPRESENTATION THAT (A) WE WILL PROVIDE CONTINUOUS, PROMPT, SECURE, OR ERROR-FREE SERVICE, (B) THE SERVICES ARE FREE OF VIRUSES OR OTHER HARMFUL COMPONENTS, OR (C) THE SERVICES WILL ALWAYS BE AVAILABLE FOR YOUR USE. TOP LEFT BOOKING ASSUMES NO LIABILITY FOR ANY ERRORS OR OMISSIONS, INCLUDING THE INACCURACY OF CONTENT, OR FOR ANY DAMAGES OR LOSSES THAT YOU OR ANY THIRD PARTY MAY INCUR AS A RESULT OF THE UNAVAILABILITY OF THE SERVICES. TOP LEFT BOOKING ASSUMES NO RESPONSIBILITY AND SHALL NOT BE LIABLE FOR ANY DAMAGE TO YOUR COMPUTER EQUIPMENT, DATA OR OTHER PROPERTY FROM YOUR USE OF THE SERVICES, WHETHER DUE TO A COMPUTER VIRUS OR OTHERWISE. THE FOREGOING LIMITATIONS SHALL NOT APPLY TO THE EXTENT PROHIBITED BY APPLICABLE LAW. Neither Top Left Booking nor any of its affiliates, members, managers, sponsors, collaborators, employees, agents or representatives shall have any liability for any damages, whether under contract, tort, strict liability, negligence or any other legal theory, including but not limited to any lost profits, direct, indirect, incidental, compensatory, punitive, special or consequential damages of any kind whatsoever (even if we have been advised of the possibility of such damages) arising from or related to your use of the Services or the content on topleftbooking.com, notwithstanding the failure of essential purpose of any remedy. The foregoing limitations shall not apply to the extent prohibited by applicable law.